Note: keep in mind that computer time module and time tracking module have separate user privileges.TimeCamp allows you to create an expanded organizational structure of users. You can create multiple groups with separate settings and switch between 3 default user privileges classes. Administrator can see reports of all users from the group he’s in and all the subgroups. He can also adjust system settings, add new users, create and edit groups. Supervisor can see reports from all users from the group he’s in and all the subgroups. He can not change any system settings. User can only see his/her own report. 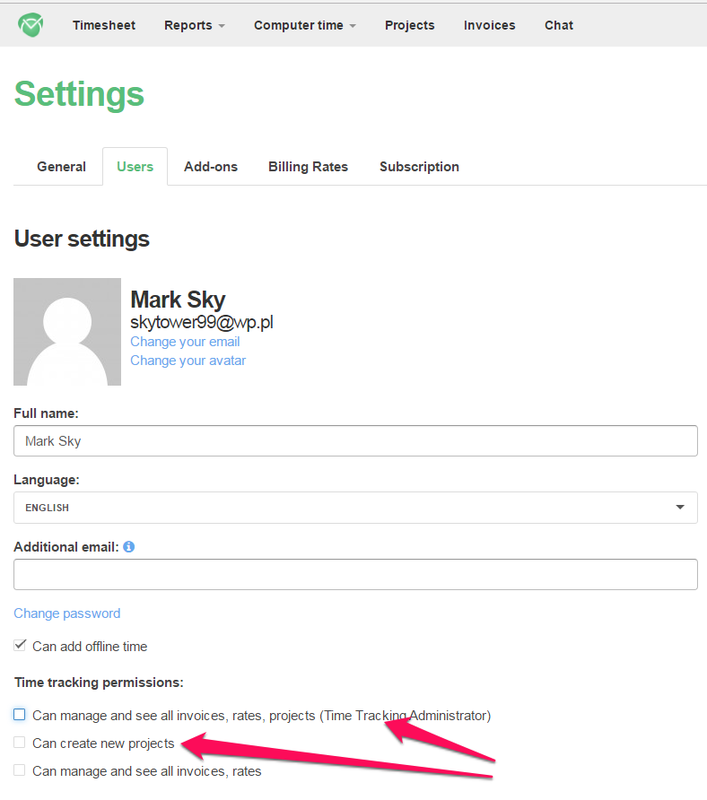 By registering a new TimeCamp account you’re automatically gain Administrator’s privileges. Each user invited to TimeCamp by someone else receives user privileges. Note: only Administrator can change other users’ privileges. To change user privileges go to system settings, select Users bookmark and find desired user on the list. Click on currently assigned privileges type, and you’ll be able to change it. The time tracking module has a separate, independent privileges system. Each project or task can have different settings, which allows you to adjust the task structure specifically to your needs. 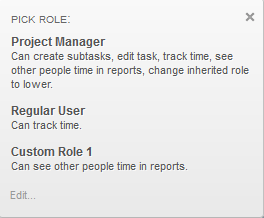 By default, there are 2 predefined roles: Project Manager and Regular User. Project Manager has a full control of the task – he can create subtasks, edit task’s settings (change keywords, assign new people, change projections) and generate reports containing time gathered by other people assigned to the specific task. Regular User can only track time on assigned task and generate his/her own reports. However, TimeCamp allows you to create your own time tracking roles. Login to TimeCamp Dashboard with administrator’s privileges and go to system’s settings (or simply use this link) – next, enter settings for “Time Tracking” addon. Enter new role’s name and click on “Add User Type” button. 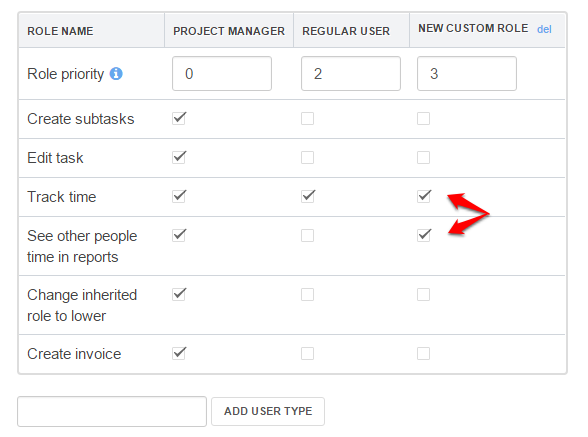 In the example given below, users with newly created “New Custom Role” will only be able to see reports from assigned tasks – they won’t be able to edit tasks, assign new users etc.). You can edit created roles at any time. 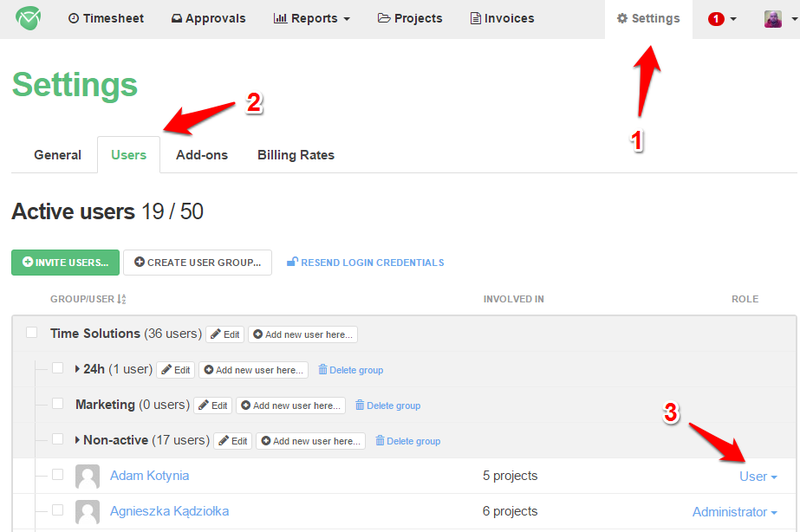 To change user’s role go to project management page and select the desired task. The edit panel will be displayed on the right of the screen, with the “People ” section. Find the desired user and click on the currently assigned role’s name. Then, simply select a new role from the list. You’re done! In disregard to roles which are assigned to users on a specific project or task, there are two special roles which system’s administrator can assign to each user. Typically users only have access to tasks which have been assigned to them. If they’re assigned as Project Manager, they can edit information about the task (like name, keywords, users assigned etc.) as well as add new subtasks. If they’re added as regular users they can only track time in tasks they’ve been assigned to. Time Tracking Administrator can edit settings for all task in the whole organization. Note that this kind of user will not be able to track time in tasks which he’s not assigned to. With this option enabled users can create projects in our system. Typically users can only create subtasks for tasks, to which they’re assigned as a Project Manager. Time Tracking Administrator can create projects by definition. Have we made a good job with this post? How to check if we regularly use data from timesheets? © 2019 TimeCamp, Inc. All Rights Reserved.